Dhaka, Jan 28 (Just News): After meeting with her party's policymakers, BNP chairperson Begum Khaleda Zia is going to sit with 20-party alliance leaders tonight (Sunday night) as a Dhaka court is set to deliver verdict in a graft case filed against her on 8 February. The meeting is scheduled to begin around 8:30pm at the BNP chairperson's Gulshan office, said party senior joint secretary general Ruhul Kabir Rizvi. He said the meeting was convened to discuss the overall situation of the country following the court's decision to pronounce the verdict in Zia Orphanage Trust graft case. On Thursday, the Special Court-5 in Dhaka fixed 8 February to deliver the verdict in the Zia Orphanage Trust graft case against Khaleda Zia and five other people. The Anti-Corruption Commission filed the Zia Orphanage Trust graft case on 3 July 2008 with Ramna police station accusing Khaleda, her eldest son Tarique Rahman, now living in the UK, and four others for misappropriating over Tk 21 million that came as grants from a foreign bank for orphans. Earlier on Saturday night, Khaleda had a meeting with her party's standing committee members at the same venue and discussed the issues relating to the probable court verdict in the graft case and worked out the party's next course of action. 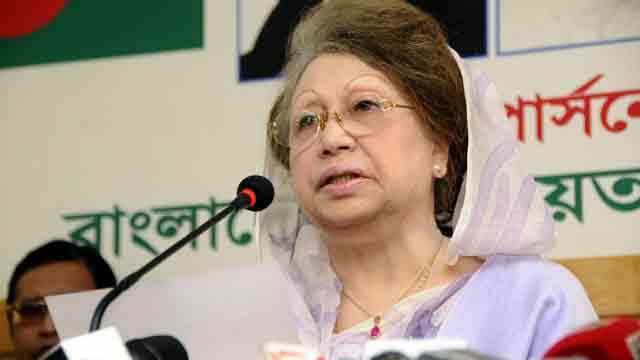 Briefing reporters about the outcome of the meeting, party secretary general Mirza Fakhrul Islam Alamgir said the BNP policymakers said the entire nation has got worried and aggrieved over fixing of date for pronouncing the verdict hurriedly. They also observed that the move was taken as part of a conspiracy to "destroy democracy and foil an inclusive national election. We urge people to get united and be vocal against the government's plot in the name of trial." Under the circumstances, the BNP standing committee members urged people to get united and be vocal against the government's 'plot in the name of trial'.